Our park was established in 2008, in honor of our brother, Bart. 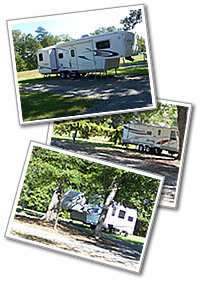 We are conveniently located 1/2 mile from Jordan Lake in a quiet, rural setting, just off US 1 in Moncure, NC. Guests are in close proximity to Raleigh, Durham, Chapel Hill, Pinehurst, New Hill, Sanford and Southern Pines. Our private family-owned park is nestled among big shady oak trees, and offers well maintained sites with full service hook up including water, sewer and 30 and 50 amp electrical services. We also offer boat storage year round at reasonable rates. We ask that our guests adhere to all of the guidelines to ensure a pleasurable stay for everyone at the park.